Tây Nguyên, translated as Western Highlands and sometimes also called Central Highlands, is one of the regions of Vietnam. It contains the provinces of Đắk Lắk, Đắk Nông, Gia Lai, Kon Tum, Lâm Đồng. This region is sometimes referred to as Cao nguyên Trung bộ (literally "Midland Highlands"), and was referred to during the Republic of Vietnam as Cao nguyên Trung phần (literally "Central Highlands"). The native inhabitants of the Central Highlands are the Degar (Montagnard) peoples. Ethnic Vietnamese (Kinh) people arrived in the area during their "march to the south" (Nam tiến). The Vietnamese now outnumber the indigenous Degars after state sponsored settlement directed by both the government of the Republic of Vietnam and the current Communist government of the Socialist Republic of Vietnam. The Montagnards have fought against and resisted all Vietnamese settlers, from the anti-Communist South Vietnamese government, the Viet Cong, to the Communist government of unified Vietnam. The Champa state and Chams in the lowlands were traditional suzerains whom the Montagnards in the highlands acknowledged as their lords, while autonomy was held by the Montagnards. After 1945, concept of "Nam tiến" and the southward expansion was celebrated by Vietnamese scholars. The Pays Montagnard du Sud-Indochinois was the name of the Central Highlands from 1946 under French Indochina. Up until French rule, the Central Highlands was almost never entered by the Vietnamese since they viewed it as a savage (Moi-Montagnard) populated area with fierce animals like tigers, "poisoned water" and "evil malevolent spirits." The Vietnamese expressed interest in the land after the French transformed it into a profitable plantation area to grow crops on, in addition to the natural resources from the forests, minerals and rich earth and realization of its crucial geographical importance. An insurgency was waged by Montagnards in FULRO against South Vietnam and then unified Communist Vietnam. A settlement program of ethnic Kinh Vietnamese by the governments of the Republic of Vietnam and the Socialist Republic of Vietnam was implemented and now a Kinh majority predominates in the highland areas. After mass demonstrations and protests during 2001 and 2004 by ethnic hill tribe minorities against the communist government, foreigners were banned from the Central Highlands for a period of time. Dong Son village in Đắk Lắk Province, surrounded by mountains. Tây Nguyên is a plateau bordering the lower part of Laos and northeastern Cambodia. 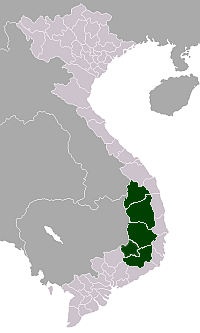 Kon Tum Province shares a border with both Laos and Cambodia but Gia Lai Province and Đắk Lắk Province only share borders with Cambodia. Lâm Đồng Province is landlocked, and thus has no international border. Actually, Tây Nguyên is not situated on a unique plateau, instead it lies on series of contiguous plateaus, namely Kon Tum Plateau at the height of 500 m, Kon Plông Plateau, Kon Hà Nừng Plateau, Pleiku Plateau with the height of around 800m, Mdrak Plateau of approximately 500 m, Đắk Lắk Plateau of around 800m, Mơ Nông Plateau with the height of about 800–1000 m, Lâm Viên Plateau of approximately 1500 m and Di Linh Plateau of about 900–1000 m. All of these plateau are surrounded by the high mountain ranges and mounts (South Annamite Range). Tây Nguyên can be divided into 3 subregions according to its deviation in topography and climate, namely: North Tây Nguyên (Bắc Tây Nguyên) (inclusive of Kon Tum and Gia Lai provinces), Middle Tây Nguyên (Trung Tây Nguyên) (covering provinces of Đắk Lắk and Đắk Nông), South Tây Nguyên (Nam Tây Nguyên) (Lâm Đồng). Trung Tây Nguyên has lower altitude and therefore has a higher temperature from other two subregions. Below is a list of officially recognized ethnic groups in Vietnam that are indigenous to the Central Highlands and nearby areas. They speak Austroasiatic languages of the Katuic and Bahnaric, as well as Chamic languages (which belong to the Austronesian language family). Population statistics are from the 2009 Vietnam Population Census. Tây Nguyên contains in it many primitive forests and is protected in its national parks, such as Cát Tiên National Park, Yok Đôn National Park, Kon Ka Kinh National Park. The region has an average altitude of 500–600 m with basalt soil, suitable for planting coffee tree, cacao, pepper, and white mulberry. Cashew and rubber plants are also planted here. Coffee is the most important product of Tây Nguyên, with production centred in Đắk Lắk Province. The provincial capital of Buôn Ma Thuột hosts a number of major coffee factories, including ones owned by major producer Trung Nguyên. Tây Nguyên is also the third natural bauxite source in the world. Plans for bauxite mining in the area have met with some controversy, both because of the environmental impact of the proposed operations, and because of labour issues. Tây Nguyên is home to the most prominent and also the most endangered species in Vietnam and Southeast Asia, namely, the Indochinese tiger, the huge gaur, the Wild Asian Water Buffalo, the banteng, and the Asian elephant. In 2012, at least three Vietnamese soldiers were arrested and imprisoned for their online pictures showing them torturing and murdering Gray-shanked douc Langurs. ^ Oscar Salemink (2003). The Ethnography of Vietnam's Central Highlanders: A Historical Contextualization, 1850–1990. University of Hawaii Press. pp. 35–336. ISBN 978-0-8248-2579-9. ^ Zottoli, Brian A. (2011). Conceptualizing Southern Vietnamese History from the 15th to 18th Centuries: Competition along the Coasts from Guangdong to Cambodia (A dissertation submitted in partial fulfillment of the requirements for the degree of Doctor of Philosophy (History) in The University of Michigan). p. 5. ^ Oscar Salemink (2003). The Ethnography of Vietnam's Central Highlanders: A Historical Contextualization, 1850–1990. University of Hawaii Press. pp. 155–. ISBN 978-0-8248-2579-9. ^ Lawrence H. Climo, M.D. (20 December 2013). The Patient Was Vietcong: An American Doctor in the Vietnamese Health Service, 1966–1967. McFarland. pp. 227–. ISBN 978-0-7864-7899-6. ^ Lawrence H. Climo, M.D. (20 December 2013). The Patient Was Vietcong: An American Doctor in the Vietnamese Health Service, 1966–1967. McFarland. pp. 228–. ISBN 978-0-7864-7899-6. ^ Spencer C. Tucker (20 May 2011). Encyclopedia of the Vietnam War, The: A Political, Social, and Military History: A Political, Social, and Military History. ABC-CLIO. pp. 182–. ISBN 978-1-85109-961-0. ^ Oscar Salemink (2003). The Ethnography of Vietnam's Central Highlanders: A Historical Contextualization, 1850–1990. University of Hawaii Press. pp. 151–. ISBN 978-0-8248-2579-9. ^ Christopher R. Duncan (2008). Civilizing the Margins: Southeast Asian Government Policies for the Development of Minorities. NUS Press. pp. 193–. ISBN 978-9971-69-418-0. ^ McElwee, Pamela (2008). ""Blood Relatives" or Uneasy Neighbors? Kinh Migrant and Ethnic Minority Interactions in the Trường Sơn Mountains". Journal of Vietnamese Studies. Regents of the University of California. 3 (3): 81–82. doi:10.1525/vs.2008.3.3.81. ISSN 1559-372X. Retrieved 17 August 2015. ^ Bray, Adam (June 16, 2014). "The Cham: Descendants of Ancient Rulers of South China Sea Watch Maritime Dispute From Sidelines". National Geographic News. National Geographic. Retrieved 3 September 2014. ^ Cota-Larson, Rhishja (July 26, 2012). "Vietnam: Soldiers Arrested for Torturing, Killing Endangered Langurs". Annamaticus.